The first sentence of Preamble to the Declaration of Independence reads: “We hold these truths to be self-evident, that all men are created equal, that they are endowed by their Creator with certain unalienable Rights, that among these are Life, Liberty and the Pursuit of Happiness.” The Declaration of Independence is not a legal document or even a formal declaration of independence. By the time of its adoption, twelve of the thirteen colonies had already declared independence with the passage of the Lee Resolution. The natural aristocracy I consider as the most precious gift of nature, for the instruction, the trusts and government of society. And indeed, it would have been inconsistent in creation to have formed men for the social state, and not to have provided virtue and wisdom enough to manage the concerns of society. May we not even say that that form of government is the best which provides most effectually for a pure selection of these natural aristoi into the offices of government? Of course, this natural elite would be expected to act in the interests of the people and would ultimately be answerable to the people at large. I advance it therefore as a suspicion only, that the blacks, whether originally a distinct race, or made distinct by time and circumstances, are inferior to the whites in the endowments both of body and mind. It is not against experience to suppose that different species of the same genus, or varieties of the same species, may possess different qualifications. Will not a lover of natural history then, one who views the gradations in all the races of animals with the eye of philosophy, excuse an effort to keep those in the department of man as distinct as Nature has formed them? Nothing is more certainly written in the book of fate than that these people are to be free. Nor is it less certain that the two races, equally free, cannot live in the same government. Nature, habit, opinion has drawn indelible lines of distinction between them. It is still in our power to direct the process of emancipation and deportation peaceably and in such slow degree as that the evil will wear off insensibly, and their place be pari passu filled up by free white laborers. Ironically, it was precisely Jefferson’s belief that “all men are created equal” that undergirded his argument for racial separation. Jefferson believed that moral sense lay at the foundation of politics; if all men possess moral sense, then all are capable of self-rule. He maintained that blacks were equal to others in moral sense, claiming that their propensity for thievery was an adaptation to their circumstance rather than something innate (popular opinion at the time was that blacks were inherently morally defective). It was for this reason that Jefferson argued that blacks were capable of–even entitled to–self-governance. If anything, his estimation of them may have been too charitable. But perhaps this argument for separation is one to which some racial egalitarians would be amenable (“racial integrationists are the real racists!”). The scholarly consensus regarding the Declaration is that, philosophically, it is purely Lockean. Jefferson was indeed influenced by Locke, and there are a handful of textual parallels between the Declaration and Locke’s writings. But often overlooked is the fact that Jefferson was also strongly influenced by Scottish Enlightenment philosophers, including Francis Hutcheson, Adam Smith, Thomas Reid, and Lord Kames. This is the argument put forth by Garry Wills in Inventing America. Wills may overstate his case, but his book poses a worthy challenge to the prevailing interpretation of the Declaration. Little is known about Jefferson’s formative intellectual influences. All of his papers and books were tragically destroyed in a fire in 1770. In recreating his library, however, Jefferson drafted a list indicating the names of some of the books that were lost, and a number of works by Scottish thinkers are mentioned. Jefferson’s professor at the College of William and Mary was a Scotsman, William Small, who had a great influence on Jefferson and would have introduced him to Scottish Enlightenment thought in his lectures on ethics. The influence of Scottish Enlightenment thinkers, Hutcheson in particular, also extended to colonial America at large. The students of Francis Alison, a former student of Hutcheson and a professor at the College of Philadelphia, included five future signers of the Declaration, for example. Scottish Enlightenment philosophers held much in common with Locke, but where Locke emphasized individual rights, they tended to emphasize the communal nature of man and the importance of common-sense morality. It was from Scottish Enlightenment thought that Jefferson drew his understanding of moral sense. The phrase “pursuit of happiness” is often offered as a defence of the “American dream” and is equated with the pursuit of financial success, or even with libertine individualism. But this strays far from Jefferson’s conception of it. The notion of “happiness” here could be compared to the ancient Greek concept of eudaimonia, “the good,” which Aristotle defines as the continual exercise of virtue and reason. Jefferson similarly describes virtue as “the foundation of happiness” in a letter in which he discusses Epicureanism (Aristotle went further, emphasizing the necessity of active self-actualization, but the principle here is similar). 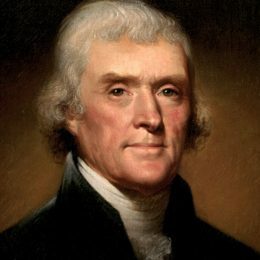 For both Jefferson and the Greeks, the pursuit of virtue is inherently political, communal life being a necessary condition for self-actualization and growth in virtue. Public opinion of Jefferson has shifted over the past few decades. More recent assessments of Jefferson have generally castigated him as a racist bigot. The state of American politics is such that the militant Leftists who want to tear down statues of Jefferson are less deluded than Jefferson’s more moderate admirers. The far-Left’s hostility toward the Founding Fathers and American heritage in general is a boon to white nationalists in this regard and is already having the inadvertent effect of steering patriotic white Americans in the direction of overt racial identity politics. It would be foolish not to seize upon this historical moment by invoking American patriotism in defence of white nationalism and debunking the myth that America was founded upon the principles of racial egalitarianism and hyper-individualism. The Lincoln-Douglas Debates, ed. Edwin Erle Sparks (Dansville, N.Y.: F. A. Owen Publishing Co., 1918), 26. Garry Wills, Inventing America: Jefferson’s Declaration of Independence (Garden City, N.Y.: Doubleday, 1978), 246. Thomas Jefferson to John Adams, October 28, 1813. Thomas Jefferson, Notes on the State of Virginia (Richmond: J. W. Randolph, 1853), 157. An Autobiography of Thomas Jefferson (New York: G. P. Putnam’s Sons, 1914), 77. Notes on the State of Virginia, 93. See Thomas Jefferson to George Washington, June 20, 1791.